For Steven Broglio, an assistant professor of kinesiology at the University of Michigan, it was a mixed feeling of concern and curiosity as to the extent of the injury. Since 2007, Broglio has been collecting data on the violent collisions that occur in high school football and their contribution to concussions and other head injuries. 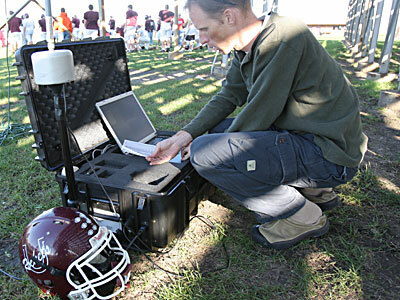 Unity players use helmets with padded sensors called the Head Impact Telemetry System. 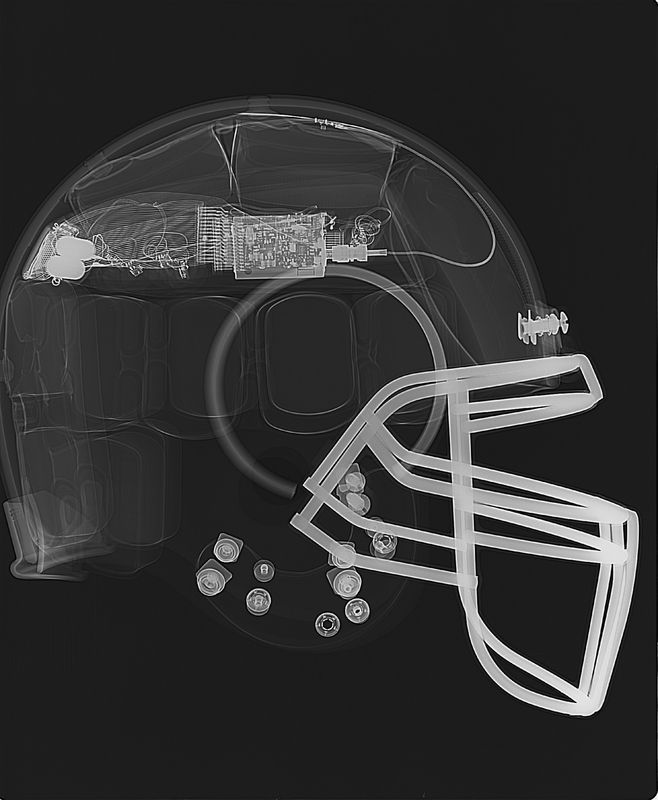 Using a sensor similar to what is used in car air bags, the HITS helmets record and transmit the magnitude of each impact and its location on the helmet to a computer located on the sideline within about 10-20 seconds. Broglio is able to monitor these collisions and alert the coaching staff if an impact exceeds the threshold known to cause concussions, about 90-100 g-force. Listen to Broglio describe the HITS research. In the last four years, Broglio has recorded over 120,000 football collisions with 25 resulting in a concussion for the player. However, on this night, he would record data on a much more rare injury - a broken neck. After briefly losing consciousness on the field, the Unity cornerback was taken to a hospital emergency room and was diagnosed with a concussion and a stable left C6 facet fracture, otherwise known as a broken neck. Data from the collision showed the hit occurred at the top right side of the helmet at a amazing 114 g-force. Just for comparison, a shuttle launch is about 3 g-force while a rolling fighter pilot sustains about 5-10 g-force. Thankfully, the player was released from the hospital 48 hours later with a hard neck collar. While his football season was over, he returned to play basketball twelve weeks later. Broglio describes the encounter in a letter to the New England Journal of Medicine. The goal of the research is to perfect the technology so that similar, less expensive systems can be used on many more football sidelines. Broglio said a number of other researchers at universities across the nation, including Virginia Tech, the University of North Carolina and Dartmouth, also are using the system as the basis for studies of biomechanical processes caused by concussions and traumatic brain injuries. The current system has a price tag of about $60,000 while the customization to each helmet costs an additional $1,000. "Ultimately, we're trying to use these measures to predict concussion," Broglio said. "If someone exceeds a certain level then we would know they have a concussion and we could pull them." With the recent attention to concussions at the NFL level, there is hope that research will also benefit high school and college players. "To us, the larger public health issue is with the 1.5 million high school kids that play football each year. Not the 1,500 that play in the NFL," Broglio said.